UnDungeon is a beautiful and complex Action/RPG pixelart game with a rich background, immersive story and seven unique characters. 4,603 backers pledged €95,519 to help bring this project to life. Good day, Heralds! Ri Ra, the game designer, is here. As mentioned in our last update, we have accumulated a lot of news about which we would like to talk separately, without mixing them with progress reports. I. UnDungeon is a relatively large-scale project, primarily by the standards of indie development. It is much more ambitious than any of the team members expected at the beginning of the journey. Such an underestimation of our resources and volumes of work is an eternal indie disease: we are not the first, we are not the last. However, we have never even considered the possibility of cutting out the content or making changes to the concept to accelerate the development. Our primary goal is to deliver the same game that we’ve promised. To achieve this ambitious goal, we've signed an agreement with a partner a few weeks ago which helps us with further development funding and assists in obtaining a good platform deal. The fact that we are in search of a deal means that we can not officially announce UnDungeon's release on the consoles at the moment, although the work in this direction is carried out together with the already announced platforms (PC/Mac/Linux). When/if such an agreement is concluded, it will entail a guaranteed announcement of console versions, attracting more attention to the project and participating in major game dev events. But until then, we must keep our mouth shut on the consoles and the name of our partner. What does this partnership mean for the team (and UnDungeon, respectively) and our fresh-baked partners? The logic is very, very simple for both sides. 1. We receive all the necessary funding to complete the project on a full scale, realize all the ideas and fill the game world with content in the originally planned volumes, fulfilling our obligations owed to the backers. 2. As a small team, we have very limited opportunities in promoting the game and attracting new players. The appearance of the publisher allows us to partially shift these functions to him and concentrate on the development. 3. The possibility to strengthen weak points in the development. For example, we have already added a second programmer to the team to speed up the prototyping of the mechanic and gameplay features, as well as the level designer, because of the abundance of tasks, your humble servant did not have time to pay enough attention to the levels. Now we count on a notable progress in these aspects. 4. The last, but the most important. We still maintain our "independent" status and fully retain control over the development of UnDungeon, as well as the adoption of all critical decisions. Don't be afraid of the intervention into the development by the partner - our agreement turned out to be very democratic. 1. As in any other similar situation, the partner/publisher receives % of the project's sales after the release of the game. 2. The opportunity to replenish the portfolio with such an unusual and hopefully promising project as UnDungeon. II. As mentioned in the previous updates, we are going to prepare a demo version for the backers. The demo will be released approximately in April 2018. It will include several hours of a raw gameplay and 3 (maybe 4) playable characters. III. The release of UnDungeon is scheduled for December 2018 - January 2019. At the moment, we are working following a plan in close cooperation with the partner/publisher, so no further shifts are supposed to happen. By the end of this update, I would like to focus on the following fact once again: nothing threatens the project, the situation is stable and gets better day by day. The team is working hard, and we just ask you for a little more patience. Laughing Machines wish you a Merry Christmas and happy New Year holidays. The demo is getting closer, and with it comes the Shift! Martin Mengui, Andre, and 67 more people like this update. Another backer hoping for an update here lol. Hope everything is going well! It's been half a year and no updates. Is there any news? Really excited for this! hope it comes to Switch! Hey super excited for this demo, any update on when we can try that out? I finally have a computer that can handle decent games without going full derp mode, and I've been ignoring the projects I backed because of the lack of said computer. Just installed the other projects I backed and went looking into this one. Sad to see it's still in the development stage and the demo hasn't even released but here's hoping it is finished without much more delay, I'm looking forward to this one. Just dropping by to spur you on, looking forward to this one! Any updates on the new game? I would surely love to sink my teeth in the new demo. The next update will be exactly with demo announcement! Thank you everyone for continuous patience and support, we are alive and working hard on it! April has passed, I'd love to see another update on that demo! Glad to hear that you have a publisher. That does wonders for a game during release. Thanks for this honest update of the company state! Good luck with the next steps and keep up the good work... Merry Christmas! I've been waiting 5 years for Radio the Universe. I'm prepared to wait as long as it takes to have a game I will love. Do your things, ladies and gentlemen, and deliver on your amazing promises. If that's what you do, I don't care if it takes a while. 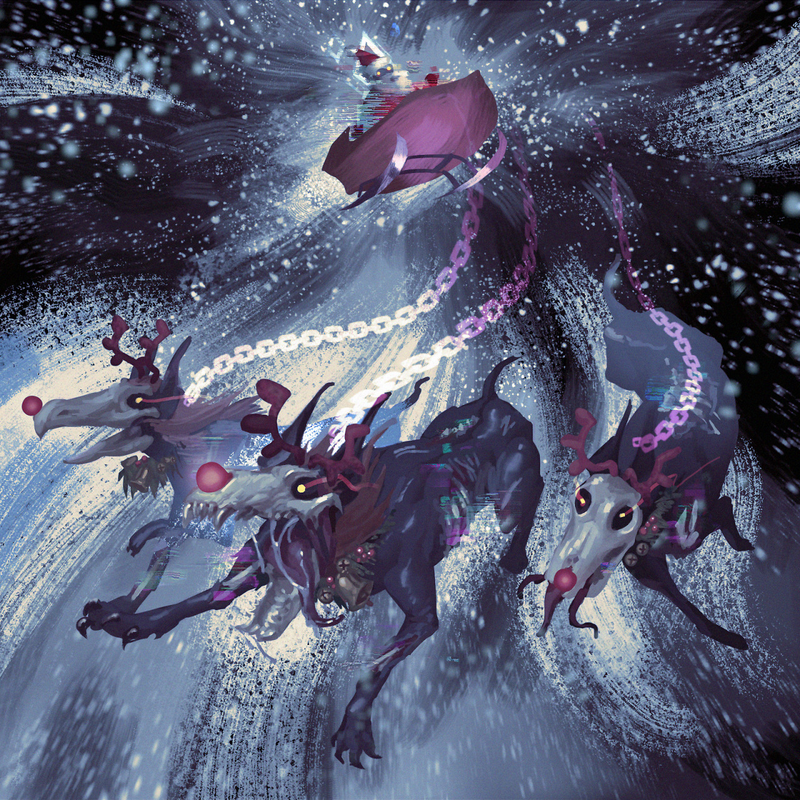 BTW, please add those demonic reindeer as Xmas holiday spawns, they are too good. Thanks for the update. Merry Christmas! I'm glad I wasn't the only one to read Them #3 and comment on it. Was kind of weird, and still not sure after being told it's a joke, if it is. Games take forever to create, and even longer to make a good one! Having backed a lot of these, patience is something I know quite well. You do what you need to do to make your dream a reality. Kickstarter is just a starting point, sometimes you need a bit more. We'll all be here ready to help if needed. That image is pretty awesome, btw.. Any chance of a wallpaper sized version? Has the “secret” message under part 3 of the partnerships deal gone unnoticed? “We are in slavery and without rights. *They took the game* Help! Help!” I realize you stated that you have control of crucial elements of the game. So is the message just a sly joke or is this project actually in danger? And if so how can we help? I'm glad you guys are moving forward with the project but I think the lack of communication with backers is unacceptable. In your last update several months ago, you said the release would be "slightly" pushed back. Now, five days before the end of the year (and in your *third* update over the past year), you tell us that the development time for the project has literally doubled. Additionally, you have shown little-to-no evidence that you guys have even made any progress on the game. The update in October indicated that you had "completed a great part of work on level generator", but now you say you just hired another programmer to "team to speed up the prototyping of the mechanic and gameplay features, as well as the level designer". Prototyping? That doesn't sound like a "great part of the work" is complete. As it stands, there's really nothing to show for the past year. Given the state that this campaign is now in, I don't think you have the luxury of saying "oh sorry we don't update you often, but just watch our Twitch stream" anymore. I'd like to see regular updates posted here on Kickstarter explicitly showing meaningful progress on development. I don't care about gifs and art and memes, I'd like to see that you guys value and are actually doing something with my and 4600 other backers' hard-earned money which we supported you with. We need go deeper with you guys! Do what you need to do. I trust you guys! Good news :) Take your time, guys, and create a big, awesome game ;) Good luck with consoles partner, I’m still hoping for a Switch release - this platform is perfect for this type of games, IMO. While I understand all of these things that still a year out from your campaign date. It hurts. Congratulations on the good news, guys! Hopefully this partnership will help the game become even better. Merry Christmas and keep up the good work!